Hello Linux Geeksters. As you may know, CodeSlayer is an open-source code editor, written and C and using GTK+ as interface. Despite the fact that it is lightweight, it has all the features of a modern editor, including: tabbed interface, find and replace function, file navigation system which is organized into projects and global search across projects. The latest version available is CodeSlayer 4.1.1, which comes with some improvements. For more information see the official page. 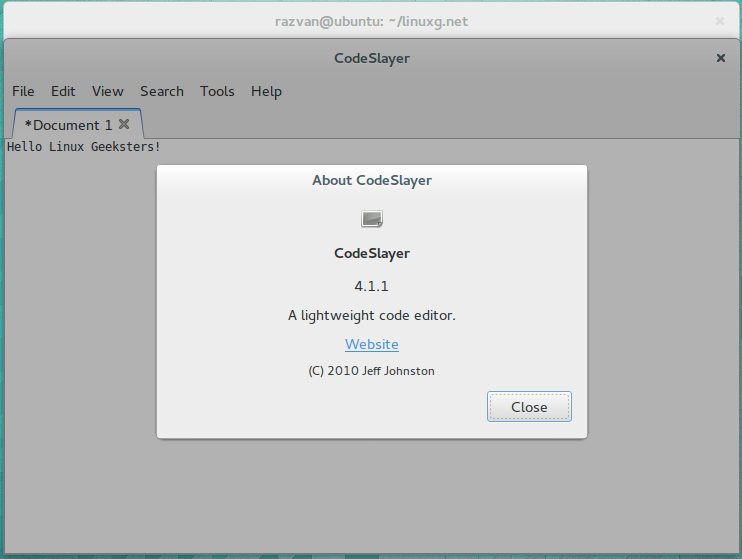 In this article I will show you how to install CodeSlayer 4.1.1 on Ubuntu 14.04 Trusty Tahr, Ubuntu 13.10 Saucy Salamander, Linux Mint 17 Qiana and Linux Mint 16 Petra. Because it is available via the GetDeb repository, installing CodeSlayer 4.1.1 on the latest Ubuntu and Linux Mint systems is easy. All you have to do is add the ppa to your system, download and import the key, update the local repository index and install the codeslayer package.